The first match after Schweinsteiger's injury is a match that FC Bayern shouldn't look for excuses for not winning. Augsburg, who have been promoted from the 2nd division, are 2nd from bottom in the Bundesliga and have injury problems of their own as they will be missing midfielder Axel Bellinghausen, goalkeeper Simon Jentzsch, their captain Uwe Moehrle and the suspended striker Torsten Oehrl. FC Bayern will be without Breno (comeback still unknown), Schweinsteiger (comeback late December/early January) and Robben (comeback sometime this year). 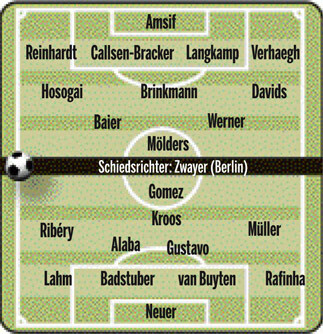 Who will play the Schweinsteiger role? I think Kroos will play deep next to Tymo and Alaba on the wing with Ribery. I think Alaba will directly replace Schweini with Kroos still playing as CAM. I want to see Kroos in the CM role, but Jupp has made it really clear he'll play either Tymo or Alaba, it seems. Hope it's true, Bild is usually right. I'm very happy he's getting a real chance. Well, he's in incredible form in my new Football Manager 2012 game, in fact so much so that I'm starting to think I should bench Ribery after the first month of fixtures. And Football Manager always reflects real life!